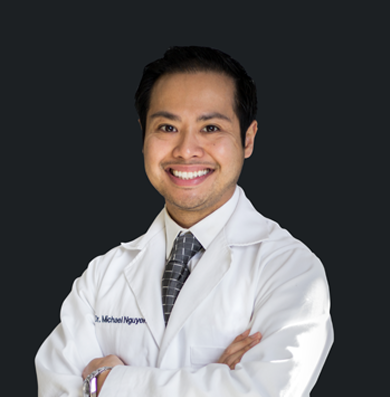 Dr. Michael Nguyen is a physician at Vein Institute and Pain Centers of America with a clinical and academic practice focused on pain medicine and venous disease. Dr. Nguyen is a highly experienced and well respected pain and vein specialist having treated thousands of patients. Dr. Nguyen serves on the advisory panel for Medtronic, helping to implement strategies and design technology to improve venous care. Dr. Nguyen is Board Certified in Venous and Lymphatic Medicine and Interventional Pain. He completed residency and advanced fellowship training at Harvard Medical School. Dr. Michael Nguyen was one of the most respected Fellows at Harvard and received the prestigious “Fellow of the Year” award during his final year of training. Upon completion of his training, Dr. Nguyen joined the Harvard faculty where his accolades included “Outstanding Teacher of the Year” and “Mentor of the Year.” Dr. Nguyen has published about vein disease in the medical literature, including a textbook on minimally invasive treatments for chronic venous insufficiency. Dr. Nguyen’s work has been featured on television and print.